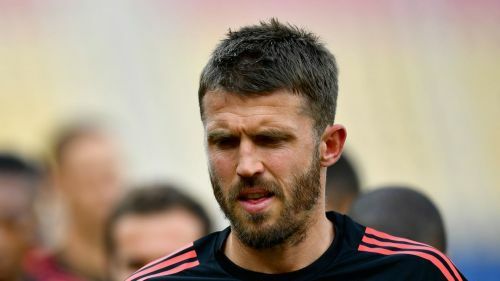 Michael Carrick believes it would be "amazing" to be a manager but insists he is in no rush to find a permanent position. The former England midfielder is now one of Jose Mourinho's assistants at Manchester United following his retirement from playing at the end of last season. It is a role the 37-year-old is relishing and one he believes will give him the perfect grounding in the art of coaching and management. "I don't want to throw that out there and say I'd want to be United manager," he told The Times. "It would be amazing to be a manager, but I am not in a position to call that. It's not fair or respectful to be going down that route at this stage. "I'm really enjoying it. It's a role that I never thought at this stage of my coaching career that I would get. "I'm not there as an intern to try and just learn. I'm there to do a job as well and at the same time try to improve myself. "It's kind of about learning what works for certain lads. Do they need an arm around the shoulder or a bit of a dig in the ribs to liven them up? Those are the skills of coaching and managing." Carrick is taking nothing for granted, though, and knows the chances of making it as a successful manager are slim. He added: "I'm not blase enough to think that I'm going to be a manager. The truth is: I don't know. "I'm at that stage now where I'm thinking: 'Will he make it or will he not?' Everyone can't make it. I'll just have to give it my best shot and see where it takes us. "I'm not chasing it. I'm in a fantastic position right now. I'm not looking to get out of that position any time soon because I want to do something else." Did José Mourinho have a role to play in Ole Gunnar Solskjær’s United revolution?